We’ve written several articles on what to look at when buying a home with a septic system. 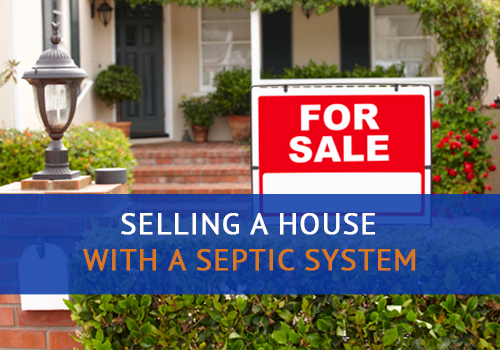 But, what if you’re selling a house with a septic system? Chances are that you already know your houses quirks. You know what needs to be repaired and what has just been fixed. But, do you know this about your septic system? Many people don’t, because the majority of septic systems are underground, meaning that it isn’t seen very often. But, it’s an essential part of the property you’re selling and should be in good condition when the buyers move in. Selling a house is not an everyday occurrence for most of us, and you probably have plenty of questions already. But, we’re a septic company so we would like to help you understand what you should do about your septic system when selling your house. Take a look below at the article. We’ve listed some common things to consider while selling a house with a septic tank on the property. 1. Do a Visual Inspection. Since you probably know your septic system well, take the time to look over it. Make sure you know where your septic tank and drain field are. However, we suggest that you leave the more in-depth inspection up to a professional. But, don’t hesitate to mention problems that you may have noticed to the certified inspector. After all, you’re the one that uses it the most. 2. Schedule an Inspection with an Expert. Over the years, septic systems will wear down, and parts will break. It is your duty as a seller to make sure that the buyers are getting what they pay for. That means making the buyer aware of problems with the septic system and what needs to be repaired. The septic tank should be inspected for significant problems and regular maintenance. The inspector will detect any cracks, leaks, or tank defects during evaluation. This also includes any outlet device and or septic lid. Think about how well you’ve kept up on maintenance like regular pumps and drain field inspections in the past. Chances are your property will look better if you have a record that shows you’ve regularly taken care of the septic system. One part of selling a house includes knowing the property and its boundaries. And, the septic system is part of this, even if most of the components are either underground or hidden. Your drain field is a part of this. What should you know about the drain field? You should know the size, location, ground material, and layout of your drain field. Part of the inspection should make sure that the drain field is operating correctly. During these inspections, your septic professional should fill out a Voluntary Inspection and Assessment Report, which covers all of the necessary details. Take a look here to see, the form that Florida professionals use. 3. Use a Qualified Septic Inspector. When planning for these inspections, you should call a licensed professional. An inspection is an essential step in selling a house with a septic system because the buyer needs to know the potential problems and repairs that they will encounter if they buy your property. Don’t pay someone to start repairs that they can’t finish. 4. Follow Up with the Inspection. After the inspection, you should let potential buyers know the state of the septic system. You should expect to repair septic issues if the licensed inspector finds any. However, you are not responsible for regular maintenance that may happen in the future. So, make sure you know what you are required to pay for and what you don’t need to fix before selling your house to potential buyers. 5. Act-On Repairs When Its Right. Selling your house is hard enough but dealing with septic repairs when you’re in the middle of selling is more difficult. To save from stressing too much, we recommend that you act on these repairs quickly unless it’s a timely project. You probably don’t want to be showing your house on the market during a drain field replacement. It’s a big project and will take some time to replace. Use your best judgment on when you should make these repairs. Talking to your septic professional can help you schedule the right moment to act. 6. Get a 2nd Opinion. We know that septic work can be costly. This is especially true if you’re replacing a septic tank or a drain field. Like, we’ve mentioned before, you want to make sure that you’re contracting the right septic company for these jobs. If for some reason you don’t feel the inspector is qualified to do the job well, then we suggest you get a second opinion. It never hurts, and you can rest easy knowing that the people buying your house will have a healthy septic system for the years to come. Since we know that selling a house can be a complicated process, we want to help you make it simple. If you have any questions about your septic system or notice that it may need an inspection, give us a call at Advanced Septic Services.